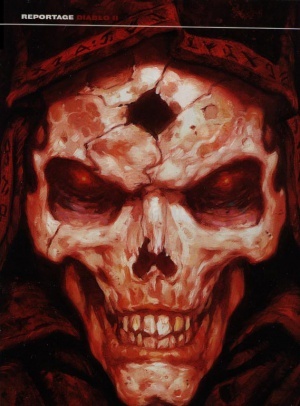 The Dark Wanderer is a human male attempting to contain the evil essence of Diablo in his soulstone. This character is an evolutionary stage; he began as the Warrior character in Diablo I, and only became the Dark Wanderer during the time after that game. He is a central figure in the story of Diablo II, featured in most of the cinematics as he wandered across the world, through the Eastern Deserts (where he visited the tomb of Tal Rasha/Baal), to the jungles of Kehjistan where he encountered his other brother Mephisto. At that point the Dark Wanderer finally lost his battle to contain Diablo's essence and was transformed into the huge red demon, then traveled to Hell through a dark portal. The Dark Wanderer's backstory was metconed in Diablo 3 and grew more complicated. Instead of an anonymous warrior he retroactively became King Leoric's oldest son, Aidan. Thus the events in Diablo I were much more dramatic, as Aiden the Warrior had to defeat his father's animated bones and kill his younger brother Albrecht to break the possession Diablo had wrought upon him. Furthermore, Aiden impregnated the witch Adria, and thus became the father of Leah, a major character in Diablo III. As Diablo I draws to a conclusion, the hero defeats Diablo, and takes Diablo's Soulstone within his own body, intending to contain Diablo there forever- which had potentially unforeseen consequences. According to Deckard Cain's Journal the hero grew troubled and withdrawn over a couple of days after his apparent triumph in the dungeons below the Tristram Cathedral, before abruptly leaving town and wandering to the East. 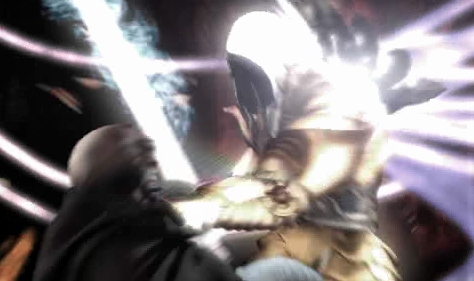 As revealed in the epilogue cinematic of Diablo I, the hero still thinks he can control and contain the demon, but is clearly being influenced by Diablo in his desire to head to the Eastern Deserts, for there lies Baal's tomb, which Diablo clearly clear intends to visit in order to free his brother. Furthermore, evil and demons follow behind the Dark Wanderer, as Diablo summons forth monsters and evil, like dark footsteps left behind the unwitting human. This re-emergence of evil was responsible for the destruction of Tristram and the surrounding areas as seen in the opening setting of Diablo II. The Dark Wanderer (left) and Archangel Tyrael (right) do battle during a Diablo II Cinematic. After the destruction of Tristram the Dark Wanderer proceeds to the east where he frees Baal and Mephisto from their respective prisons before shedding the last of the hero's humanity and metamorphosed into Diablo- ceasing to be the Dark Wanderer. Diablo then proceeds by entering Hell where he will eventually be slain by the band of heroes. 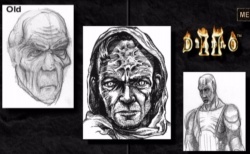 The Diablo II wiki entry for the Dark Wanderer may be found here. The Dark Wanderer does not appear in Diablo III. He is mentioned in Cain's Journal and the Book of Cain, but that is all in summary of the story of the earlier games, much of which was metconed to better lead into the events of Diablo III. His story and events in Diablo I were changed to transform the anonymous Warrior hero into Prince Aidan, King Leoric's estranged older son. Many fans believed the Dark Wanderer to be, specifically, the warrior class due to gender and skin tone. Blizzard later confirmed this theory, and it became canon, which was expanded on in a metcon for Diablo III as the Warrior become Prince Aidan and ultimately the father of Leah. The other two heroes from Diablo I met equally-grim fates, as the Rogue returned to her monastery, where she and most of the other rogues were killed in the fighting that erupted after the monastery was visited and destroyed by the evil unleashed by the Dark Wanderer's passage. The Rogue specifically became the Elite Blood Raven. The Sorcerer traveled to the East, independent of the Dark Wanderer and in his magical researches in Lut Gholein he discovered the Arcane Sanctuary where he went mad and became The Summoner. The Identity of the Dark Wanderer is never revealed in any of the games or books, but in the Diablo II PnP RPG module released as The Awakening, his name is revealed as Qarak, the last surviving member the Order of the Gauntlet, an order of adventurers. In 2011 Chris Metzen informed the world that Blizzard had given the Dark Wanderer a metcon. When the Dark Wanderer was human he was the long lost son of King Leoric and his name was Aidan. This would also make him an an older brother to Prince Albrecht. In the Diablo 3 beta it was revealed, from Leoric's Journal, that Aidan went off to become a warrior after Leoric made Tristram his new seat of power. He later returned to Tristram to put the Skeleton King to rest and later defeat Diablo. At media event E3 in 1998, Blizzard North released a trailer for Diablo II that did not make it into the release of the game, which has footage of the Wanderer traveling on the back of a carriage in the rain, cradling the (then-enormous) soulstone containing the essence of Diablo. His mouth was sewn shut, his eyes smoldered red, and his entire appearance was very different from that which players saw in the release of the game. This trailer, also unlike anything seen in the release of the game, was actually narrated by Aidan himself, not Marius, which is a drastic perspective shift for the narrative and would have perhaps brought about an entirely different game. 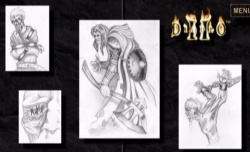 The wanderer was iterated upon heavily during the development of Diablo II. 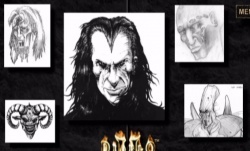 In the Collector's Edition of the game, a player could watch the cinematics disc in "high quality" where they could also see very low-res slideshows of concept art that were not released on any other format, and three of these slides featured distinctly different versions of the wanderer. While this is not relevant today, as not only has ten years passed since the release of Diablo II, but there is an entirely different team working on Diablo III, it is still interesting to see how this character who is pivotal to the plot of all three games progressed over time. E3 trailer courtesy of the IncGamer's Diablo III Channel. The last piece being strikingly similar to the version that was used for the E3 cinematic in 1998. This page was last edited on 31 October 2013, at 15:31.